Sister can be the best friend or just closest person in the life. Anyway as a part of family she deserves the best wishes and presents on holidays. In order to please your beloved sister, you do not have to wait for any solemn occasion or special event. It is enough to make a pleasant surprise in a very ordinary day, ordering the delivery of a bouquet for sister. 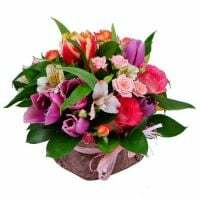 If the flowers will be presented without any reason, you are allowed to choose a simple, not pompous bouquet that will harmonize with the recipient of good mood. For such a present, you can order a bouquet of gerberas, sunflowers, and dive into the world of dreams with the help of pastel colors composition: blue, pink, purple buds will leave a mark in the heart of the sisters! AZ-Flowers.com will fulfill not only your wishes, but also the dream of recipients. We are at your service for 24 hours a day, 7 days a week to help you get closer to the closest people.